The plot is pretty straightforward: a group of 42 students are thrown into a government sponsored game called the Program where they are transported onto an isolated island and are told to kill each other. Each chapter tends to focus on one student, and delves into their minds. It’s fascinating, in my opinion, to see how people would react in these sort of situations, and how easily trust among people can be broken (especially among friends). The story mainly focuses on three main protagonists Shuya Nanahara, Noriko Nakagawa, Shogo Kawada and antagonists Mitsuko Souma and Kazuo Kiriyama. I really like Shogo Kawada because I feel he’s quite well-rounded compared to the other main protagonists, and Mitsuko Souma because of her backstory and how her past shaped her current self. There are other characters whom I enjoy reading, but I’ll leave that as a surprise. I wanted to read this book after finishing reading The Hunger Games trilogy and hearing some criticisms that Hunger Games is similar to Battle Royale. While the basis may have similar elements—children forced to kill each other and corrupt government—Battle Royale is by far more realistic and gruesome than Hunger Games. 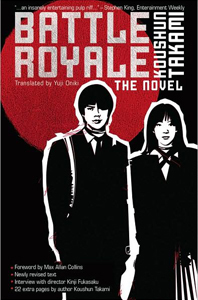 I tell my friends that Battle Royale makes Hunger Games seem like a G-rated book, but if you love Hunger Games series or even Lord of the Flies, you’re definitely enjoy this book. In all seriousness, I read and loved the first Hunger Games book, and then read Battle Royale afterwards. It’s a very different experience, and in my opinion a better one for older audiences, especially because it makes it so personal with more than just one character.